For a first-time visitor to Dutch Design Week, the seemingly endless number of massive empty warehouse and factory spaces left over from the days when Philips was once headquartered here, now been taken over by designers and creatives, was simply mind-opening –if not reaffirming of how artists and designers are essential for urban revitalisation. One such space is Plan B. Located in a former Philips laboratory, in an industrial park just outside of the city center, Plan B has been Kiki van Eijk and Joost van Bleiswijk’s studio and office space since 2016. 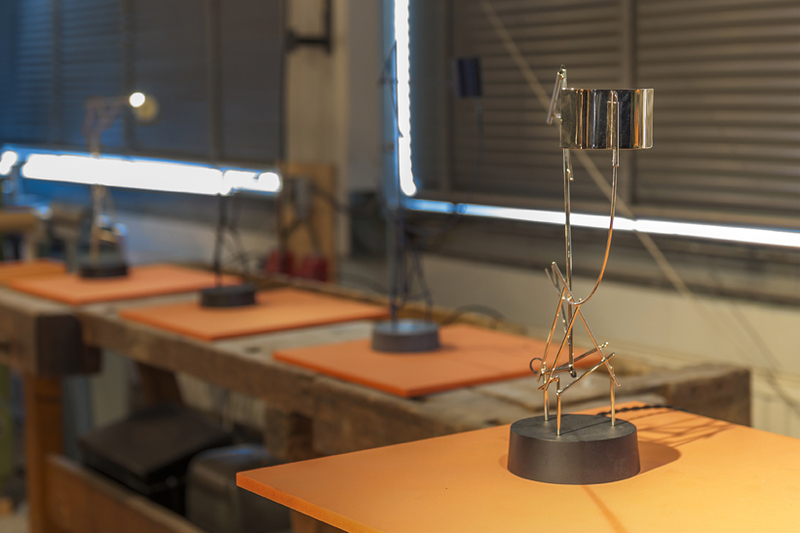 For Dutch Design Week this year, they decided to celebrate its opening with the exhibition The Tinkering Labs, a true reflection of the tinkering spirit of these pioneering designers. 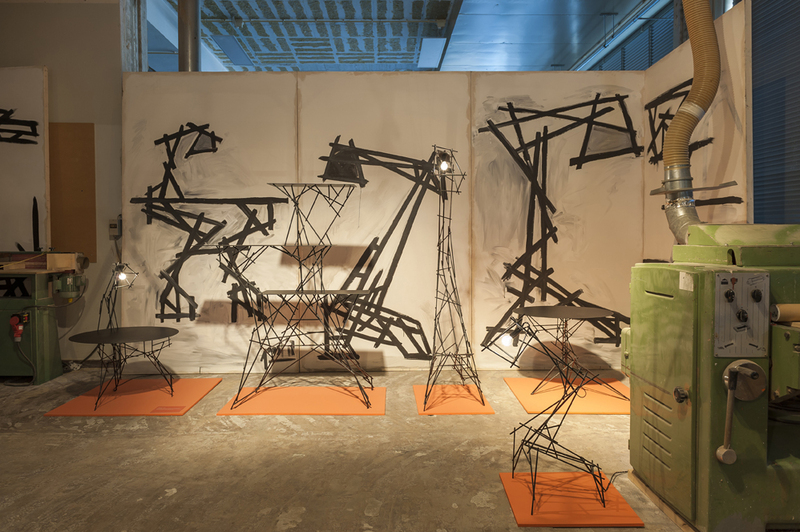 Here, the work is presented in the studio itself, placed strategically next to the machines used to make them –and in many cases, with smaller models or samples of materials placed next them– in order to show the importance of each step in the process, the research and ideas that go into making each project. “The idea for this installation was to show how small ideas become big projects,” says van Eijk. 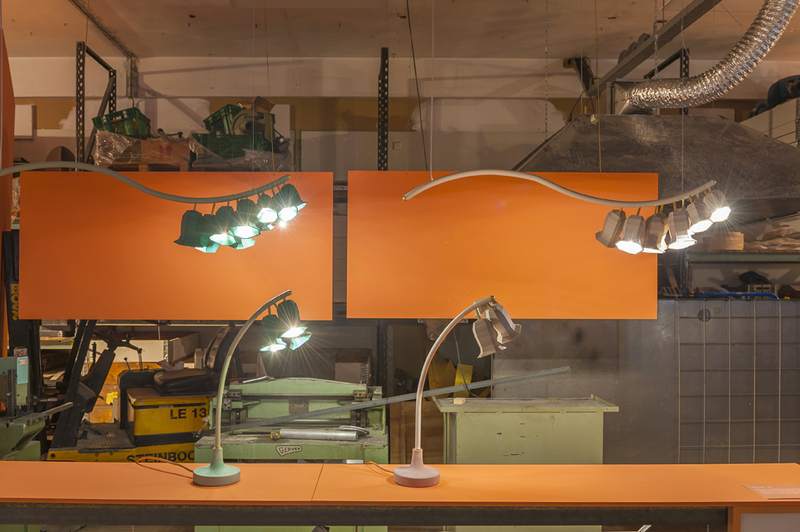 The lighting was left purposely low and the finished products were placed on orange pedestals or mounts, the color chosen as the contrast to the green of the industrial machines, as well as a way to draw the eye to the work installed around the space. Plant Lamps is a new series of lighting by van Eijk, inspired by her looking at nature as an abstract form. 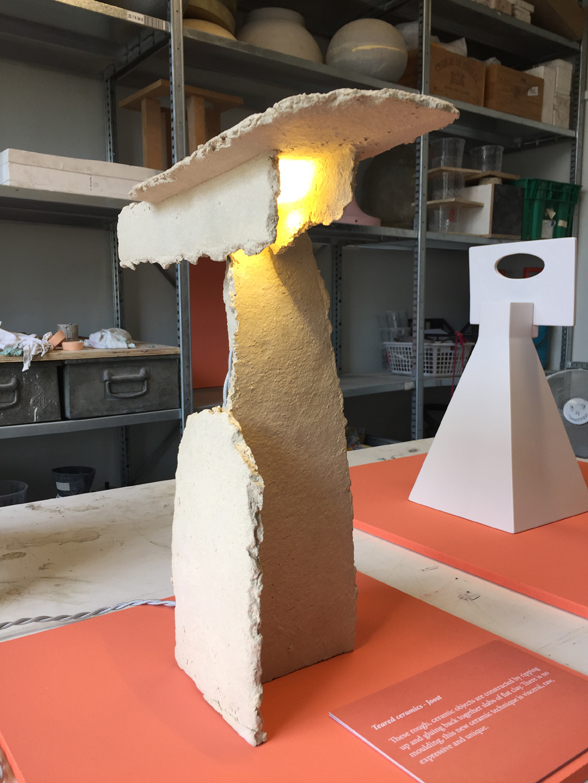 The lamps show her continued interest in mixing the handmade with technology: the caps, that resemble bluebell flowers, are 3-D printed with bio-plastics and ceramic, and the surfaces are left purposely a bit rough, so we see the lines and details that goes into their making. The soft LED light is like the stamen, hanging inside. Then there’s Windows of my Eyes, a new project made in collaboration with the Dutch ceramic company Cor Unum to celebrate the 100-year anniversary of De Stijl –a theme that was taken up in other exhibitions across DDW this year. 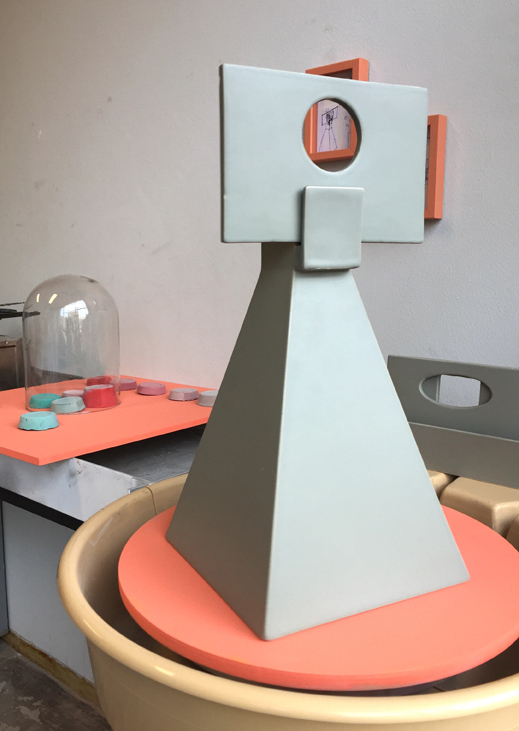 For these tabletop sculptures, the idea was about framing and, “how we look at things,” says the designer, as well celebrating Mondrian’s open-mindedness and singular vision. The Tinkering Lamps, a new series of work by Joost, were developed by experimenting with ways of capturing, reflecting and showing light. For his project with Cor Unum, van Bleiswijk played with his interest in tearing paper or cardboard –as seen in his Tearing Tapestry rugs for Nodus, also on view–, while these are made with ceramic slabs that have been torn up and glued back together, taking a form that recalls a constructivist sculpture. Throughout the vast space, Kiki and Joost have presented several other collections as well as sketches and drawings, offering a fantastic opportunity to have an in-depth look at their body of work. During Dutch Design Week, which runs until October 29, the duo have other ongoing projects at the Van Abbe Museum, at Kazerne, the Effenaar and Restaurant Zarzo. 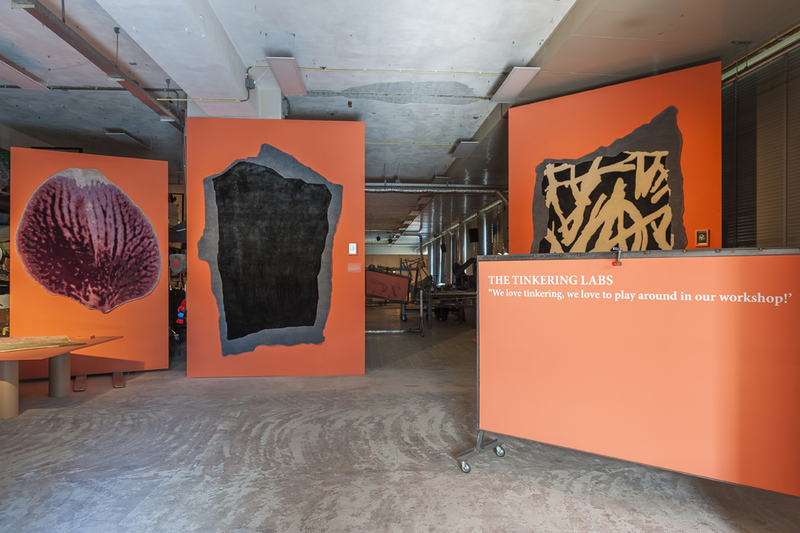 Installation view of the entryway into “The Tinkering Labs,” 2017. Dutch Design Week 2017. Kiki van Eijk, Plant Life, 2017. Kiki van Eijk, Plant Life, 2017 (detail). 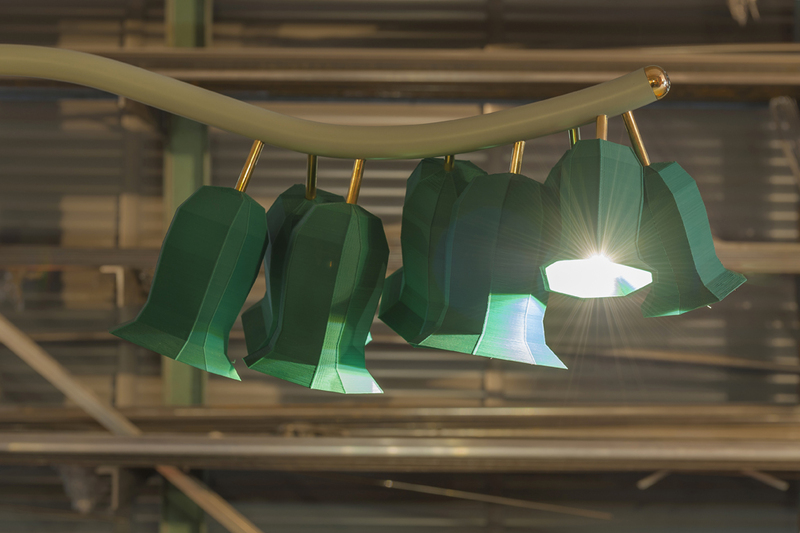 Joost van Bleiswijk, Tinkering Lamps, 2017. Joost van Bleiswijk, from the Sketched collection. Kiki van Eijk, Window of my Eyes, 2017. Photo courtesy of Studio Kiki & Joost. Teared ceramics and Window of my Eyes, 2017. Photo courtesy of Studio Kiki & Joost.